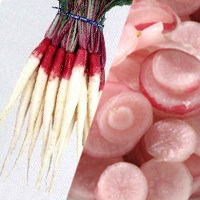 Pickled hinona is a pickled dish made using hinona, a variety of radish grown in the Shiga prefecture. It contains more carbohydrates than the juice contains in canned mandarin oranges in addition to fiber, carotene, vitamin K, and potassium. Recipes sites show you how to pickle it in sweet vinegar, salt, and sugar. The calories in Pickled Hinona per 200g(1pack) is 138 calories. Pickled Hinona is calculated to be 69Cal per 100 grams making 80Cal equivalent to 115.94g with 34.6g of mostly carbohydrates、2.8g of protein、1g of fat in 200g while being rich in vitamins and minerals such as Vitamin K and Vitamin C.